This Friday we are bringing you a preview of a recipe that features in our brand new eBook '21 DAY DETOX THE RECIPES' to give you a taste of the sort of delicious dishes we have in store for you. We have focused on transforming classic dishes such as cottage pie, fajitas, chicken 'pasta' and of course everyone's favourite... curry! 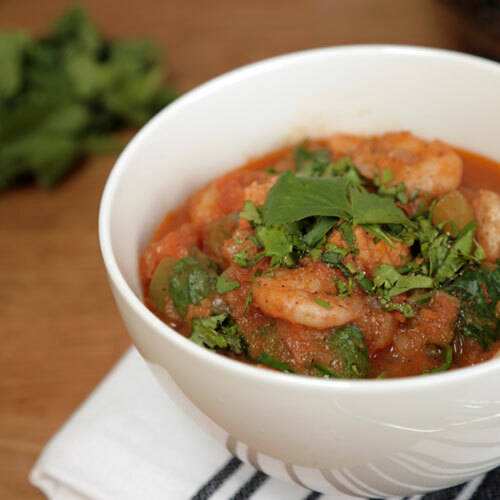 This recipe is absolutely delicious - tender fish and prawns in a rich, spicy sauce topped with fresh coriander. There is a fantastic recipe for brown rice mushroom pilaf in the book if you want the perfect accompaniment. We urge you to put down the takeaway menu and get cooking this weekend. You won't be disappointed! Heat the oil in a large saucepan and add onions, ginger, garlic and pepper. Stir, cover and cook for 6-8 minutes until soft. Add all the dried spices and fry for one minute until fragrant, stirring continuously. Add the chopped tomatoes, tomato puree and vegetable stock, stir and bring to the boil. Cover and simmer for 8-10 minutes. Add the fish and prawns, replace the lid and cook for a further 10 minutes until the fish is cooked through. Add the spinach, leaving it to wilt on top of the curry for 2 or 3 minutes then stir in when it has wilted. Sprinkle fresh coriander on top just before serving. 21 DAY DETOX THE RECIPES contains over 100 clean eating recipes, snack suggestions and drinks ideas and is available to download to your iPad or Kindle Fire for just £12.99. Find out more and purchase at www.missioncleanlean.com/ebook . Newer PostHen Do's and too much booze! Older PostEvie's Tip: Steaming Vegetables. How to & why?